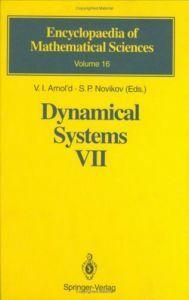 This volume contains five surveys on dynamical systems. The first one deals with nonholonomic mechanics and gives an updated and systematic treatment ofthe geometry of distributions and of variational problems with nonintegrable constraints. The modern language of differential geometry used throughout the survey allows for a clear and unified exposition of the earlier work on nonholonomic problems. There is a detailed discussion of the dynamical properties of the nonholonomic geodesic flow and of various related concepts, such as nonholonomic exponential mapping, nonholonomic sphere, etc. Other surveys treat various aspects of integrable Hamiltonian systems, with an emphasis on Lie-algebraic constructions. Among the topics covered are: the generalized Calogero-Moser systems based on root systems of simple Lie algebras, a ge- neral r-matrix scheme for constructing integrable systems and Lax pairs, links with finite-gap integration theory, topologicalaspects of integrable systems, integrable tops, etc. One of the surveys gives a thorough analysis of a family of quantum integrable systems (Toda lattices) using the machinery of representation theory. Readers will find all the new differential geometric and Lie-algebraic methods which are currently used in the theory of integrable systems in this book. It will be indispensable to graduate students and researchers in mathematics and theoretical physics.